You are currently browsing the category archive for the ‘Golden Dawn Tarot’ category. A book called The Kybalion: A Study of the Hermetic Philosophy of Ancient Egypt and Greece by Three Initiates was published in Chicago in 1912. It presented seven fundamental working principles of Hermeticism. But, what is Hermeticism? 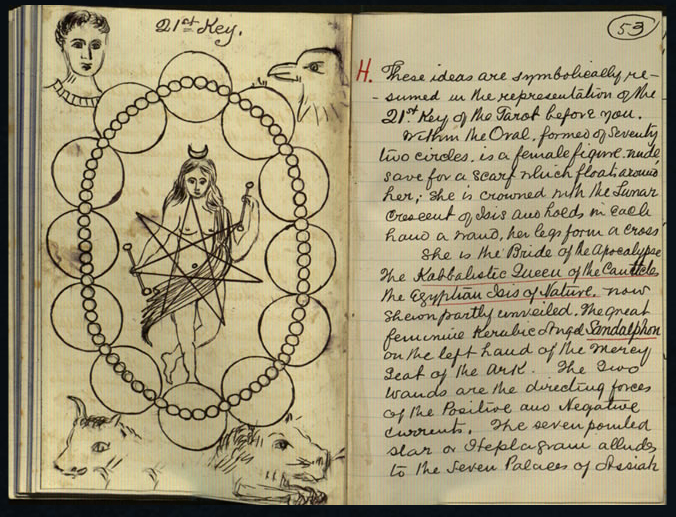 For those who are interested in material about the Hermetic Order of the Golden Dawn, you can see original ritual tools and pages from Golden Dawn notebooks at the William Butler Yeats Online Exhibit—brought to you by the National Library of Ireland. The whole exhibit is one of the most amazing web productions I have seen and worth a trip just to see what can be accomplished online. When you get to the site, launch the exhibition, and then view “interactives”. The 8th item down is “The Hermetic Society of the Golden Dawn”—click. This takes you to a virtual museum case. Click on any item you want to see, then click again on that item when it appears in the gray box. For the notebooks, a selection of pages will appear below it, which you can individually examine and read. The notebooks are from Yeats’ uncle, George Pollexfen, and some of the illustrations are quite lovely. I hope you spend time “walking” around the two exhibition rooms. You’ll find videos, Yeats’ own reading of the “Lake Isle of Innisfree,” a re-creation of a corner of his chambers, Florence Farr’s psaltery, and much, much more. Shuffle the Major Arcana and deal out six cards face down on top of each other. Turn the seventh card face up and place it in the middle of the reading area. This is the Significator and represents a starting point for the reading. Return the other six to the bottom of the deck. Deal two cards face down and turn one card up, placing this third card at the 10 o’clock position (relative to the Significator). Do this seven times placing every third card in a counterclockwise circle around the Significator [this order is added by me as a result of the example spread that follows]. You will end up with seven cards circling the card drawn in step 1. Optional: if unsatisfied that these cards suffice, deal three more cards from the remaining thirteen, taking the third, tenth and thirteen cards, and place them above the circle. The Hermetic Order of the Golden Dawn introduced what I consider the most extensive and elegant set of correspondences among the tarot and other magical systems. Here is a permutation I hadn’t seen before. It’s from The Magical Writings of Ithell Colquhoun edited by Steve Nichols. Colquhoun was an artist, magician and the biographer of MacGregor Mathers (Sword of Wisdom-o.p.). Magical Writings contains over a hundred pages of text on the Major Arcana (material on the last five cards added by Steve Nichols), plus reproductions of pages from Colquhoun’s tarot notebooks. It’s a treasure-trove for the discerning reader. THE PLANETARY TRIPLICITIES – based on correspondences to the planets and the signs they rule. These groupings can be very handy in a reading where the occurrence of two or three cards from one of the triplicities indicates a strong influence by that planetary energy. Mythically, it suggests the presence of that God/dess messing around in one’s life. I am delighted to provide this previously unpublished text, which is from a hand-copied manuscript of Sub Spe [John Brodie Innes] I apologize to those who will find many of the references difficult, but the information can help greatly in understanding the Golden Dawn approach to the Minor Arcana and also the Rider-Waite-Smith and Crowley’s Thoth decks. A glossary of Golden Dawn terms is available at The Hermetic Order of the Golden Dawn website (click on H.O.G.D. Dictionary in the directory). The Breath of God passes down through the Four Worlds of the Qabalah from the purely Spiritual to the absolutely material. In each world there is a Tree of Life and the Breath passes down from Sephira to Sephira from Kether to Malkuth and thence to the Kether of the new lower World. Atziluth, Yetzirah, Briah, Assiah (Wands, Swords, Cups, Pentacles). Thus in Atziluth the Archetypal World it passes from Eheieh the Creative Breath to Adonai Malekh. This gives its impulse to Kether of Briah the Archangelic World, and in this plane it passes from Metatron the Male Kerub to Sandalphon the Female Kerub. This in turn gives its impulse to Kether of Assiah the Astral Plane where it is received by Chaioth ha Qadesh. The Holy Living Creatures, i.e. the Zodiac which is a wheel or Vortex and goes down to Ashim the Souls of Fire. The work of this Plane being to disintegrate the Astral Form that it may pass through the veils of Negative Existence and be reborn on the Material in Kether of Assiah. Here it is received by Rashith ha Gilgalim the Primum Mobile or Lord Kelvin’s “Vortex ring” and passes down to Cholem Yesodoth. Material Wealth. Malkuth of Assiah. Thus we have four Trees one above the other containing 40 Sephiroth; i.e., the 4 Aces & 36 small cards of the Tarot arranged in 4 suits corresponding to the Worlds, each attributed to a Planet in a Decanate, and ruled by 2 Angels of the Shemhamaphoresch. This allocation of symbols gives the meaning ascribed to each card. 2. unites the Forces of the Positive and Negative, the King and Queen of the suit. Hence it signifies a beginning or Initiation. 3. produces the Prince. The Resultant of that union. A spiritual card. 4. produces the Princess. The Realization making the matter fixed or settled. Often taken as a new beginning. A material card. 5. compounded of the first odd and the first even numbers denotes Opposition. 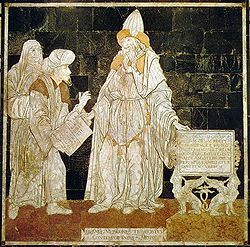 6. called by Nichomachus the form of form and by the Pythagoreans the Perfection of Parts, is taken to imply Accomplishment. 7. in Hebrew called ShBV Shibo or abundance unites the spiritual 3 to the material 4 and signifies a Supernal Force, also a possible result to be obtained by skill and courage. 8. The first cube of energy and the only evenly even number in the decade. Signifies material success, but sterile – not heading further. Solitary successes. 9. The triple Three, the first square of the odd number, of the Spiritual three. No further elementary number is possible hence it is like the horizon. All other numbers are bounded by it. Hence it implies Fundamental Force. 10. The beginning again of the decimal scale. Completed Force. YOD-HE-VAU-HE is the Supreme God of the Plane of Earthly life governing material, mental and psychic forces by immutable laws. The “God” of the Old Testament. ELOHIM = the Guiding Spirits who under YHVH sway the material forces. Always used collectively and usually translated Lord. The ELOHIM contact humanity. YHVH does not – directly. ADONI = the Planetary God of Earth. To a certain extent answers to Christ when looked at from his Human aspect, but recognising His Divinity. YHShVH is His Divine Aspect. Ace of Wands: (Kether of Atziluth, Root of the Powers of Fire) Eheieh is the Creative Sigh, the Divine outbreathing – the Eastern Hamsa. The Greek [_?_]. The Spirit of God in Genesis. By this Divine Life first enters the Kether of the highest of the Four Worlds and penetrates to Malkuth of the Lowest. In the Tarot this influence comes from the Keys to the Ace of Wands. Two of Wands: (Chokmah of Atziluth, Lord of Dominion, Mars in Aries) Unites forces of King & Queen. The Union of Fire & Water. The Spirit of Yod [Jehovah] on the face of the Water. Chokmah is exalted above every head. Mars in Aries representing the decanate is absolutely powerful. Hence influence over others. Good or bad according to dignity. Three of Wands: (Binah of Atziluth, Established Strength, Sun in Aries) Produces the Prince. Resultant of union of King and Queen. Here the union of the Earth God Yod-He-Vau-He with the Lords of Creation Binah Elohim is the basis of Primordial Wisdom. The forms of Faith and its Roots. Amen. Sun the center of Power to the Earth in the fiery Aries give realization of hopes of energy = Established Strength. Four of Wands: (Chesed of Atziluth, Perfected Work, Venus in Aries) Produces the Princess making the matter fixed and settled. EL is the definite article. The absolute. Chesed is the receptacle of all the Holy Powers and from it emanates all the Virtues. Venus in the fiery Aries has her full fruition. Hence have we perfected work. Five of Wands: (Geburah of Atziluth, Strife, Saturn in Leo) Opposition. Elohim Gebor is the Lord of Severity [and battles]. He intensifies opposition. Geburah is itself severity. It unites Wisdom and Knowledge. Here gloomy Saturn dulls the light of Leo hence we get Strife. Ultimate success or failure is otherwise [elsewhere] shown. Six of Wands: (Tiphareth in Atziluth, Victory, Jupiter in Leo) Accomplishment. The dual influences of the Earth God and the Directing Lords of Creation Elohim [Jehovah Aloah va Daath] directed to NETZACH or Knowledge give absolute success to skill and courage. Jupiter power in the shining light of Leo completes the idea. Tiphereth is the Mediating Intelligence for it causes that influence to flow into all the Reservoirs of Blessings. Hence is Victory after Strife. Seven of Wands: (Netzach in Atziluth, Valour, Mars in Leo) A possible result. A force transcending the Material Plane. Mars in Leo gives this a martial direction. Jehovah Tzabaoth the Earth God of Hosts shows terrific force but restrained. Netzach is the Refulgent Splendour of all Intellectual Virtues. The sum of all these gives Valour. Eight of Wands: (Hod in Atziluth, Swiftness, Mercury in Sagittarius) Solitary Successes. The Name is the Lord of Armies Elohim Tzabaoth. Martial Force without restraint. Mercury in the fire of the Sagittarius Centaur also gives the idea of too much force suddenly applied. Swiftness of the horse but running nowhere. Success but leading to nothing. Nine of Wands: (Yesod of Atziluth, Great Strength, Moon in Sagittarius) Strong fundamental force Shaddai el Chai = the Vast & Mighty One. Both are of the same character but less fierce than the 10. The gentle Moon somewhat restrains the fire of the Centaur Sagittarius – it giving great strength but benignly used. The Sephiroth is the Path of Pure Intelligence. Ace of Cups: (Kether of Briah, Root of the Powers of Water) The Right Hand Male Kerub [Metatron] receives the influences from Adoni Malekh. See Key Table for further information. Two of Cups: (Chokmah of Briah, Love, Venus in Cancer) Unites the King and Queen. Positive and Negative forces of Love and Pleasure. Ratziel the Archangel of the forces of a Vortex or wheel gives Power. Venus in Cancer is especially Venusian. All the Ideas tend in the same way to the unmodified and uncombined ideas of Cups – Love. Three of Cups: (Binah of Briah, Abundance, Mercury in Cancer) Produces the Prince. = Abundance resulting from Love. Tzaphkiel has to do with forces of Saturn giving the steadying quality to Mercury, the versatility which qualify the overstrong cup-action making it fruitful. Four of Cups: (Chesed of Briah, Blended Pleasure, Moon in Cancer) Produces the Princess. Realisation. Tzadkiel is the power of Jupiter so far good, but Moon in Cancer gives change and instability. Happiness approaching an end. Too passive to be perfectly complete. Five of Cups: (Geburah of Briah, Loss in Pleasure, Mars in Scorpio) Opposition neutralises the force of Cups. Khamael is the Archangel of the Mars forces. Quarrels and fighting – the antithesis of Love. Mars in Scorpio = the stirring up of stagnant water. All intensify the idea. End of Pleasure. Sadness. Deceit. Treachery in Love. 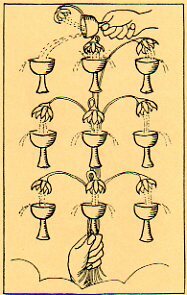 Six of Cups: (Tiphareth in Briah, Pleasure, Sun in Scorpio) Accomplishment. Raphael is the Archangel of the Sun. United influence brings to pass what is wished – e.g. on the material plane. Sensual Pleasure. The influence of Sun in Scorpio is enervating breeding corruption. If Sun is strong – vanity, etc. Seven of Cups: (Netzach in Briah, Illusionary Success, Venus in Scorpio) A possible success. The Supernal Forces Haniel is the Archangel connected with the Venus forces. Success is only outward. Supernal forces bring it to nothing. Nogah the sphere of Venus represents external splendour. Venus in Scorpio the gleam on stagnant water. All repeat the idea. Eight of Cups: (Hod in Briah, Abandoned Success, Saturn in Pisces) Solitary Success. Michael the Archangel of Fire is too strong for the feeble force of the 8. Saturn in the airy Pisces gives indolence and dispondency. The whole shows temporary success abandoned as soon as gained. Nine of Cups: (Yesod of Briah, Material Happiness, Jupiter in Pisces) Strong fundamental force. Gabriel is the Archangel of Water on the material plane. He presides over birth and generation. Hence he was announcer of the birth of Christ and of John the Baptist. More material than Sandalphon as 9 is less complete than 10. Jupiter is not such a perfect combination with Pisces as Mars, so this card is almost perfect happiness. Ten of Cups: (Malkuth of Briah, Perfected Success, Mars in Pisces) A fixed and Completed Force. Sandalphon, the Female Kerub, an Archangel yet Chief of the Angels. Showering influence of Chaioth ha Qadesh [Kether] – being the Female Kerub receiving its influence from above and transmuting it to the Zodiac, the Wheel of material creation. Mars gives the balance of Fire; Pisces that of Water. Hence this is an extremely good and fortunate card. Ace of Swords: (Kether in Yetzirah, Root of the Powers of Air) The Holy Living Creatures [Chaioth ha Qadesh], represent the Zodiac itself as Chokmah of Assiah represents its sphere. Hence a vortex receiving the influence through the veils of the negative from Malkuth of Briah which is Perfected Happiness. Two of Swords: (Chokmah of Yetzirah, Peace Restored, Moon in Libra) Unites King and Queen thus producing Harmony. Auphanim is the Wheel of Change. Thus the Angels of the Revolving Symbolism restore peace. The gentle influence of Moon on Libra fiery air, restores and pacifies. Three of Swords: (Binah of Yetzirah, Sorrow, Saturn in Libra) Produces the Prince. = The beginning and ending. Giver of Death. Aralim called Thrones more properly. Heroes intensifies the Prince. Hence Sorrow. Gloomy Saturn in fiery Air repeats the idea. Four of Swords: (Chesed of Yetzirah, Rest from Strife, Jupiter in Libra) Realization. Chasmalim = a brillant metal, perhaps gold or silver. The Angels characterised by brightness [Shining Ones]. The realization of Brilliance. Thus = Rest after Strife. Jupiter Power in Libra fiery Air. Holds its heat restrained. This repeats the idea. 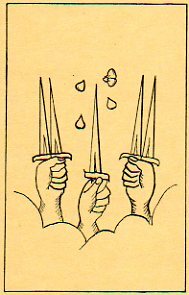 Five of Swords: (Geburah of Yetzirah, Defeat, Venus in Aquarius) Opposition. Strife. Seraphim = Angelic Beings whose character is burning or Fire [fiery serpents]. There is nothing to modify the fiery heat of strife which must bring defeat. Venus in the soft nature of Watery air succumbs to any Force. Six of Swords: (Tiphareth in Yetzirah, Earned Success, Mercury in Aquarius) Accomplishment. Malachim – King Forces & those who obtain success by commanding it. Hence success not by luck but by effort. Mercury = Genius. Versatility acting on the plastic material of watery Air strives for and obtains success. Seven of Swords: (Netzach in Yetzirah, Unstable Effort, Moon in Aquarius) Forces transcending the material Plane. Elohim = the idea of strength; hence effort but Supernal Forces overcome & render it unstable. Aquarius – Watery Air acted on by the inconstant Moon increases this result. Eight of Swords: (Hod in Yetzirah, Shortened Force, Jupiter in Gemini) Solitary Successes. Beni Elohim = Sons of God. A lower and inferior order of Angels. Not able to prevail against the restrictions of the number 8. Jupiter = Power, but having only the Airy Air of Gemini as a basis, cannot exert Power to the full. Nine of Swords: (Yesod of Yetzirah, Despair and Cruelty, Mars in Gemini) 9 = A strong fundamental force. Cherubim = Sphinxes compounded of the Elements. The supporters of Diety who fly with a swooping or circling motion, the beginning of a whirl, outcasting answering to Rashith ha Gilgalim [Kether’s First Swirlings]. The strong force tending to break up, appears like cruelty & despair. Mars has his full unmodified sway in the Airy Air of Gemini. 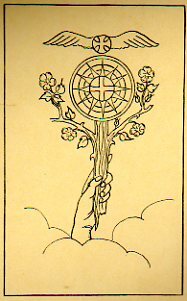 Ace of Pentacles: (Kether in Assiah, Root of the Powers of Earth) All Aces are the roots of the Powers of their Element. The Primum Mobile [Rashith ha Gilgalim] Beginning of Whirlings = Primary Vortex Ring. This is the Germ of all Matter (vide Lord Kelvin). Two of Pentacles: (Chokmah of Assiah, Harmonious Change, Jupiter in Capricorn) Unites King and Queen. The Sphere of the Zodiac counter charges all. All forces acting on Earth. Jupiter = Calm Power on Capricorn = Barren Earth. Gives Harmonious Change but no product. Three of Pentacles: (Binah of Assiah, Material Works, Mars in Capricorn) Produces the Prince = The perfect manifestation of the forces of Earth. The Sphere of Saturn [Shabathai= rest] restrains his influence. Mars shining on Capricorn the barren earth brings about material works and no more. Four of Pentacles: (Chesed of Assiah, Earthly Power, Sun in Capricorn) 4 = Realization. Sphere of Jupiter = Power [Tzadekh = righteousness]. Thus the realization of Power. Sun = Power and force on Capricorn = a barren and desert land. Dominates, but leads to nothing beyond. Five of Pentacles (Geburah of Assiah, Material Trouble, Mercury in Taurus) 5 = Opposition & Strife. Sphere of Mars [Madim = vehement strength] accentuates this. Mercury = Genius but etherial and erratic. Quite unable to deal with the dull heavy earth of Taurus. Six of Pentacles: (Tiphareth in Assiah, Material Success, Moon in Taurus) 6 = Accomplishment. Sphere of Sun = Power, Rank, Rule [Shemesh = Solar Light]. These give abundant success. Luna in her exaltation of Taurus. The Mistress of the Floods. Breaking up the dull heavy earth under the influence of Sun = Great fertility. Seven of Pentacles: (Netzach in Assiah, Success Unfulfilled, Saturn in Taurus) Force transcending the material Plane. Nogah = Sphere of Venus = External Splendour. The outside fair, but Supernal Force destroys the promise. The gloom of Saturn on the heavy dull earth of Taurus gives no success in farming. Eight of Pentacles: (Hod in Assiah, Prudence, Sun in Virgo) Solitary Successes. Sphere of Mercury = Genius [Kokab = The Stellar Light]. This when only ocasionally successful is over careful. Sun = prudence and punctuality in Virgo the fertile earth gives success in farming. Mercury unrestrained by the forces of 8 lacks initiative energy. Nine of Pentacles: (Yesod of Assiah, Material Gain, Venus in Virgo) 9 = A strong fundamental force. Levanah = Sphere of the Moon which governs the Waters of earth. A force which governs the feminine & negative is usually termed luck. This = gain. Venus the generative power in Virgo the fertile earth = material increase. Ten of Pentacles: (Malkuth of Assiah, Wealth, Mercury in Virgo) 10 = Fixed and completed force. Sphere of the Elements [Cholem Yesodoth] = Power exercised in material things only . Mercury extremely versatile genius employed in Virgo = the fertility of the earth. Therefore successful completion of material gain = Material Wealth. Malkuth of Assiah. There is nothing human below this. [The acme of worldly prosperity and progress.] (Hereafter it must take an upward curve or pass out to The Qlippoth.). Aries: Ascending Flames. A Great and Ruling Force. Leo: Rushing Flames. A Force Wise. Sagittarius: Darting Flames. A Force Great and Potent. Taurus: Fertile land in a valley. A Force Exalted. Virgo: Undulating land and low hill. A Force Just. Capricorn: Precipitous, rocky and barren land. A Force Strong and Mighty. Gemini: Cirrhous and flecked cloud. A Powerful Force. Libra: Cumulo-stratous clouds. A Force Illustrious. Aquarius: Rain descending from clouds. A Force Manifesting and Manifested. Cancer: Eddies of swirling water. A Force that renders Powerful. Scorpio: Undulating surface of water. A Wisely Dispensing Force. Pisces: Breaking waves of the sea. A Force Avenging. Added: The Major Arcana of the Whare Ra Golden Dawn deck can be seen here. The closest modern version is the Classic Golden Dawn Tarot (now out-of-print). This is my attempt to give an overview of how the astro-alpha-numeric correspondences used by the Hermetic Order of the Golden Dawn (founded in 1888 ) came to be formulated. The creators of the Golden Dawn (GD) tarot system were familiar with the French tradition (Marseilles), but deviated markedly from it in creating their own tarot lineage. 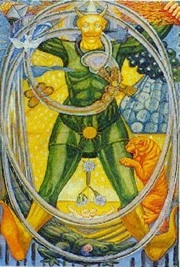 Part of the “secret” material taught in the GD were their unique attributions for the Tarot, which formed the basis for their levels of initiation. Centering on the 1880s, the Tarot was treated as a puzzle, and both French and British ceremonial magicians were racing to solve it. At the heart of this race was discovering the “real” correspondences among the Hebrew letters, astrological signs & planets, and numbers. 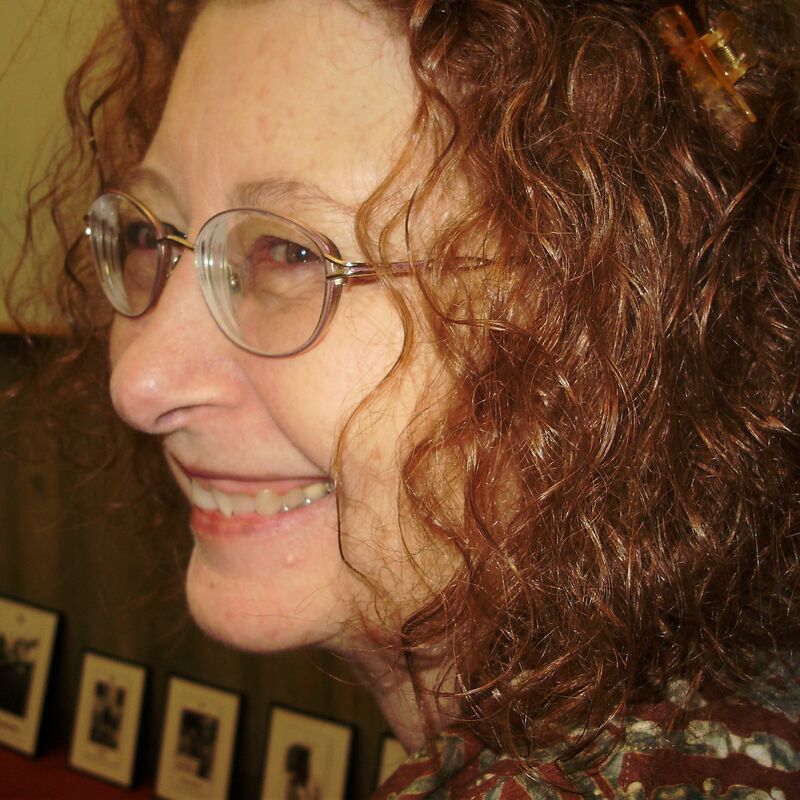 Tarot author Christine Payne-Towler in The Underground Stream coined the term “astro-alpha-numeric correspondences” to cover these. In the late 18th c. le Comte de Mellet in de Gébelin’s Le Monde Primitif suggested one solution—linking the last card with the first Hebrew letter (World=Aleph). French magician Eliphas Lévi, working in the mid-1800s, came up with his own solution based on the fact that the Hebrew letters ARE the numbers (Magician = 1 = Aleph). Furthermore, a Kabbalistic document, the Sepher Yetzirah, relates these directly with the astrological signs (the planets were not so explicitly related – creating all kinds of controversy). Writers like Paul Christian, Oswald Wirth, Papus, and members of the Brotherhood of Luxor (and the later Brotherhood of Light) continued along these lines. As soon as MacKenzie died, William Westcott bought a box of papers from MacKenzie’s widow. With two other “chiefs” (all who belonged to various Masonic and Rosicrucian societies) he started up the GD, using as its basis a manuscript written in cipher describing a series of rituals (translated and worked up by MacGregor Mathers). These rituals were based on initiation grades from the 18th c. German “New and Gold Rosicrucians,” combined with the GD correspondences as given in the cipher manuscript (two books have since been published reproducing the manuscript and discussing it in depth). 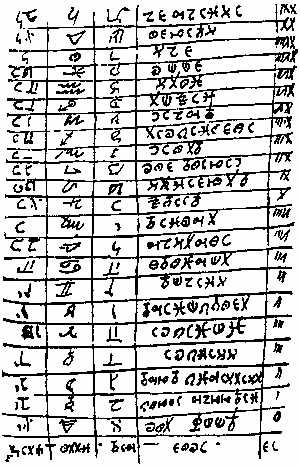 Although there is no absolute “proof” that MacKenzie wrote the cipher manuscript, the evidence is pretty strong. Both Aleister Crowley and Paul Foster Case (American member of the GD) made some minor changes to the MacKenzie/GD alpha-astro-numeric correspondences – Crowley switched positions of the Emperor and Star, and Case replaced the three “elemental” cards with the more recently discovered outer planets. A. E. Waite always declared he was dissatisfied with the correspondences, but used them in his own GD-based rite, until, in the 1920s, he finally created a revised set of Major Arcana, changing their order to fit with mystical rituals he devised for his Fellowship of the Rosy Cross. A few of the black-and-white versions of these cards that are so different from the Rider-Waite-Smith deck are illustrated in Dummett & Decker’s A History of the Occult Tarot: 1870-1970 and in K. Frank Jensen’s The Story of the Waite-Smith Tarot.